A research group in the UA Lunar and Planetary Laboratory has found evidence in meteorites that hint at the discovery of a previously unknown region within the swirling disk of dust and gas known as the protoplanetary disk - which gave rise to the planets in our solar system. Miller will present the data at the 46th Lunar and Planetary Science Conference, which is held March 16-20 in The Woodlands, Texas. The results are in preparation for publication in a journal, but have not been peer-reviewed yet. 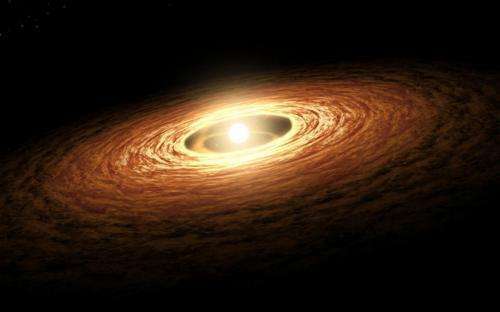 The elements that later went on to constitute the major ingredients in life on Earth - such as carbon, oxygen, nitrogen and hydrogen - originated as volatile gases in the protoplanetary disk when the solar system was less than 10 million years old, Miller said. 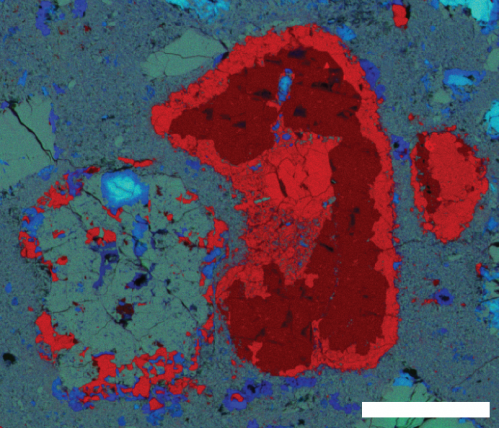 Miller and her team study meteorites called chondrites, which are thought to be the most primitive leftovers from the birth and infancy of the solar system about 4.6 billion years ago. They derive their name from their main component - chondrules, which formed as molten droplets floating in space. Specifically, Miller and her co-workers studied sections about half as thin as a human hair that were cut from R chondrites, a rare type of meteorite so named after the location where the type specimen fell: Rumuruti in Kenya. R chondrites are thought to have formed somewhere between Earth and Jupiter. 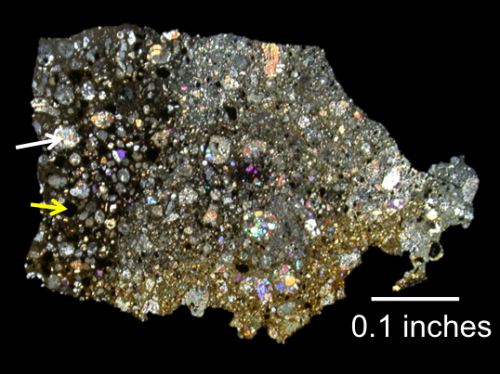 In one specimen, found in Antarctica, they discovered a new type of building block called sulfide chondrules. The samples were obtained from the U.S. collection of Antarctic meteorites - a cooperative effort among NASA, the National Science Foundation (NSF) and the Smithsonian Institution. "Unlike with meteorites that came to us serendipitously and we're lacking the context of where the material formed, with OSIRIS-REx we will know exactly where that piece came from, and we will know the travel history of Bennu - where it has been in the past," Miller said. More information: The findings of this research will be presented on Thursday, March 19, 2015, 1:30 p.m., Waterway Ballroom 6. Miller K. E. * Lauretta D. S. Nagashima K. Domanik K.